Cosmetic Acupuncture: Is It A Safe Alternative to Botox? For many, a needle is a needle and the thought of putting one anywhere near your face tops the list of things they are just not willing to try. However, as those laugh lines and crows feet pop up over the years, people often start to change their tune. Botox procedures have been performed since 2002. But not everyone is thrilled with the idea of injecting a “prescription medicine” as the cosmetic surgery industry refers to it, directly into their face. Botox is derived from the same bacteria as the toxin, botulism. And while you technically can’t get botulism from the injections, you may find yourself suffering from a fair amount of side-effects. Not to be confused with other procedures like restylane, Botox doesn’t fill lines and wrinkles. Rather, it weakens a muscle so that it is unable to contract, thus unable to form wrinkles over time. Professionals often encourage continuous injections, as results are only good for three to four months. Yet over-injecting can render facial muscles so weak that they are no longer able to support the skin, leading to extensive and permanent drooping and sagging. And an unskilled injector can leave your face lopsided if one side receives more of the product than the other. Not to mention there’s always a risk of an allergic reaction or receiving a tainted or expired product. So what is one to do if they’re looking for a non-surgical approach to treating those fine lines and wrinkles? Cosmetic acupuncture may be the answer you’re looking for. Hollywood stars the likes of Angelina Jolie and Madonna have jumped on the bandwagon, noting it’s a safer and more natural approach than many medical cosmetic procedures. The art of acupuncture has been practiced for centuries and is often touted as an effective and safe treatment for a number of ailments as well as a preventative approach. 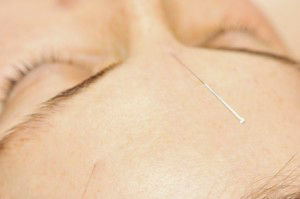 From a cosmetic perspective, acupuncture stimulates blood flow to the face, promoting collagen and elastin production. The results are reduced signs of aging including lightening of age spots, brightened skin tone, reduced rosacea as well as tackling those pesky fine lines and wrinkles. Similar to Botox injections, cosmetic acupuncture won’t have the same result as a surgical procedure. However, acupuncture has numerous other benefits besides battling the noticeable signs of aging. The movement of energy throughout the body improves mood, reduces stress and battles depression symptoms. Compare this to Botox which researchers have found actually increases depression when injected around the delicate eye area. They’ve linked the resulting inability to smile naturally with increased instances of moodiness and depression. So if you’re looking to wage war on the signs of aging that seemingly pop up overnight, acupuncture provides a safe alternative to the number of medical procedures available. Just keep in mind, laugh lines are there to remind you of how much you’ve smiled over the years. So don’t obsess about each and every wrinkle, the result will only be more worry lines. Hey Buddy!, I found this information for you: "Cosmetic Acupuncture: Is It A Safe Alternative to Botox?". Here is the website link: https://www.thealternativedaily.com/cosmetic-acupuncture-safe-alternative-botox-2/. Thank you.